When my husband and I purchased our first house I pondered the colors I thought I would like to decorate with. Keep in mind when I tell you what colors I decided on that we were in the midst of the seventies…earth tones were very popular. The sofa we purchased was a block print that included chocolate brown, rust and navy blue. That sofa was very comfortable and I’m sorry I don’t have a picture to show you. Time flew by and because I’ve always had a love of interior design (that sounds fancier than I am but I hope you know what I mean), we decided when we moved into our current house to go a different direction (color palate wise). I could have chosen blue and white and it did cross my mind, but I had seen a room in a ‘to the trade’ furniture showroom that featured hunter green carpet with hunter green walls. I know, it sounds oppressive, but with white French doors, white over mantle/fireplace and a custom-built white entertainment unit it was actually very cozy. Was being the operative word here. We lived with it for nearly 20 years! 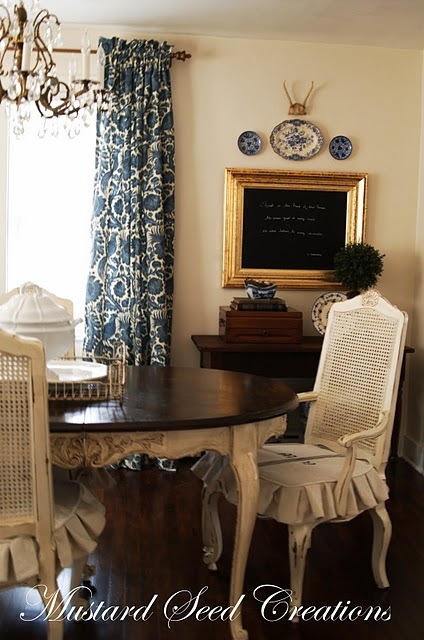 Another view of Miss Mustard Seed's dining room, don't you love it? 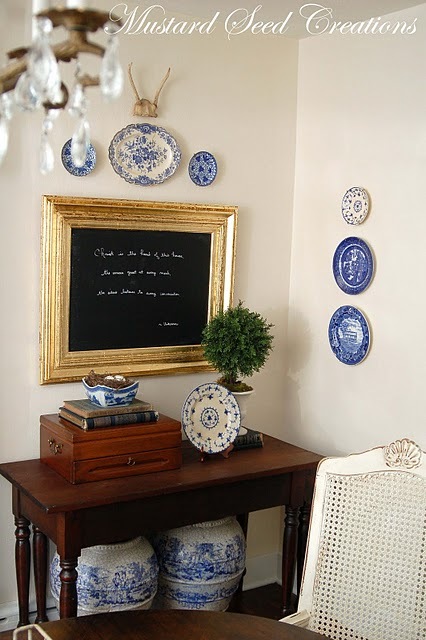 I have loved the English country style of decorating for some time (Mario Buatta was someone I followed in design publications). My accessories are pretty much the same as they were in my hunter green days—barley twist candle holders, antique mantle clock, Staffordshire figures, antlers and hunt prints or paintings. 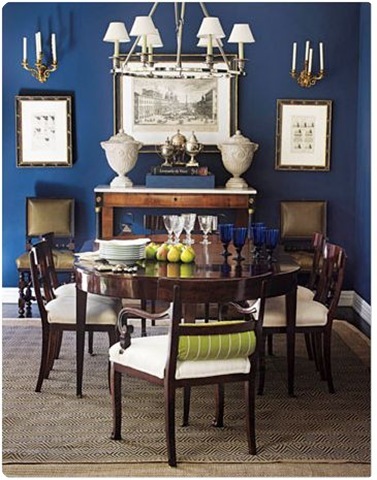 I love this shade of blue but my dining room is pretty dark to handle this dark blue. When we changed out the hunter green carpet for wood floors in all but the bedrooms I switched to red, khaki and black as the colors I used for upholstered pieces and accents. This looks so fresh and inviting. I'm not sure hubby would go for this but I love it. The thing is, through it all I have longed for a blue and white house. 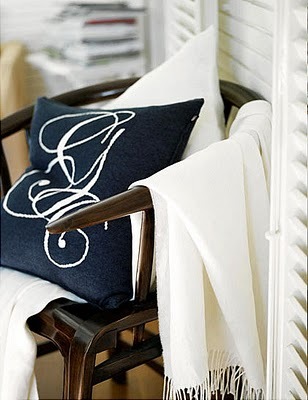 I have pulled nearly every blue and white room featured in any and all magazines. 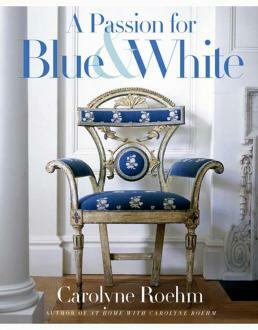 One of my favorite design books to study is “A Passion for Blue and White” by Carolyne Roehm. Passion for Blue and White says it all. 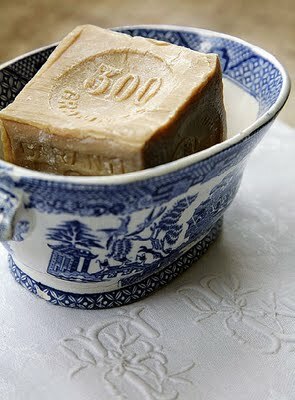 This is one of the pictures in Carolyne Roehm's book. 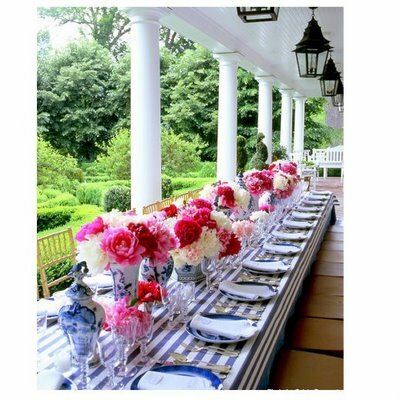 I hope to duplicate the look for an upcoming dinner in September. 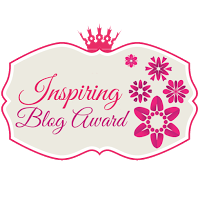 I also love this dining room by the incredibly talented Miss Mustard Seed (of Mustard Seed Creations) Visit her site and be amazed. 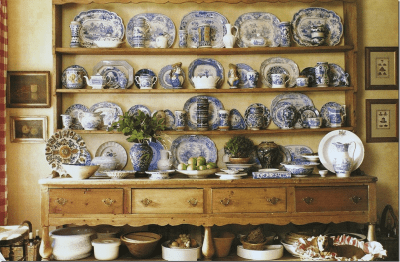 I would love to collect blue and white transfer ware dishes. This picture is of Carol Glasser's (a Houston designer) former home. There is a wonderful tool on Better Homes and Gardens site called Color-a-Room. Check it out, you can see what a room will look like with a variety of paint colors to choose from using this tool. 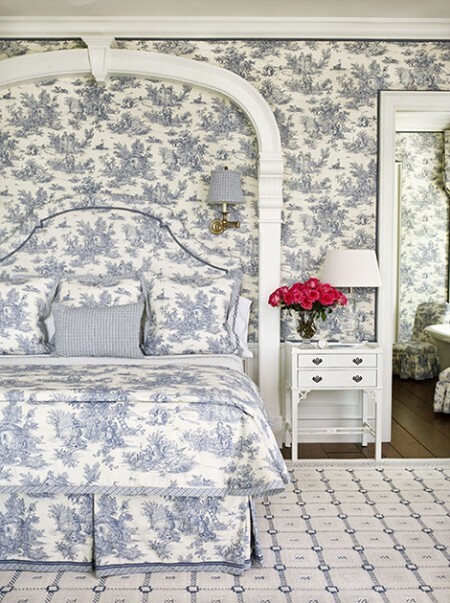 So, “why” you ask, “don’t you have a blue and white room?”…I don’t know but a girl can dream, right?